Employment Opportunities | Robert B. Payne, Inc. Working for Robert B. Payne, Inc.
As a growing company, we are in need of bright, creative thinkers with a positive can-do attitude to grow with us. 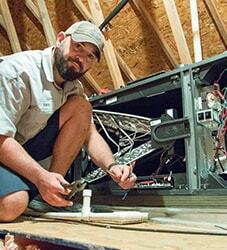 We pride ourselves on hiring the most highly trained, customer-oriented, honest, hardworking trade professionals. Our customers expect the highest level of workmanship and customer service; it is our goal to employ only those who fit the bill. All of our employees are subject to drug screenings and are expected to hold true to our company goals and mission at all times. In return, we offer our employees an atmosphere where unique perspectives and partnership is encouraged, and where a well-balanced work/home life is a company goal. We feel we have developed a reputation for providing the best service at the best price in the most efficient and courteous manner. This ideal is imparted to each new employee as they join the group and begin serving our customers. 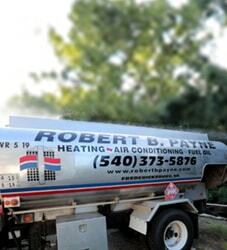 On top of customer service, Robert B. Payne, Inc. goes to great lengths to ensure that the person servicing a customer’s HVAC system is the most qualified person around. We make it our responsibility to provide training on all current and upcoming technology and equipment our staff will come in contact with. In doing this, we help our employees improve themselves so they can better serve our customers. Each employee understands that being a Robert B. Payne, Inc. employee means they are upholding over 80 years of reputation. For this reason, we are pretty choosy about the people we send to any home or business. 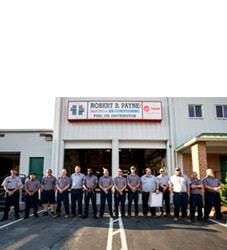 At Robert B. Payne, Inc., every employee makes a difference in succeeding at our main goal: to serve our clients and community with the highest quality of workmanship and customer service. We encourage an atmosphere of diversity and inclusion. 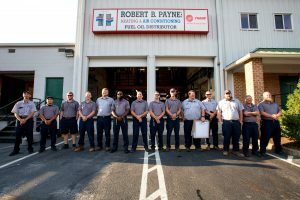 At Robert B. Payne, Inc., it is our goal for all our employees to feel respected and rewarded for working as a team towards a common goal. To view a list of current openings, click here.